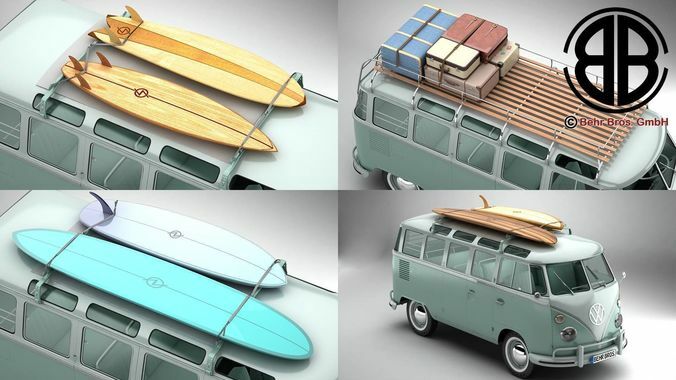 Accurate very high definition Volkswagen Type 2 Samba 1963 model with highly detailed interior fully textured and various roof racks, ladders, suitcases, a surfboard rack and surfboards. Headlights and taillights are modelled, doors can be opened. An opened and closed version of the roof is included. The model includes modeled tires. Most parts of the model have been created as SubDivision/TurboSmooth surface. This means using the 3dSMax or the Maya 2013 version you can change the resolution/smoothness of the surface very easy. If you import the lowest resolution of the .obj .fbx or .lwo version into a 3D Software that supports SubDivision surfaces you can also change the resolution/smoothness of the surface very easy. The base version of the car model which is not smoothed has of 900341 polygons. The poygon count of the base version of the accessory models which is not smoothed is the same as the lower resolution available for other software packages. Please see below. Maya 2008/ FBX/ Cinema 4D 9.6/ Lwo 6.0 / Obj/ 3ds Format: Car available in 3 different resolutions. Interior and exterior are saved separately so you can use the car also without the interior. Accessory models are available in 2 different resolutions.